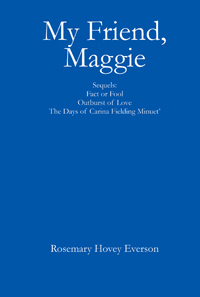 My Friend, Maggie is a fictional novel series; Fact or Fool, Outburst of Love and The Days of Carina Fielding Minuet. Rosemary acknowledges her instructors from Long Ridge Writers Group, Outskirts Press and her editor, Lori, for their help throughout the novel(s) publication. 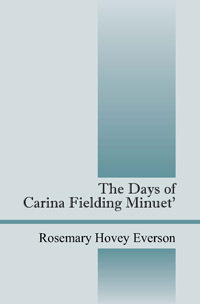 Author Rosemary Hovey Everson began her career as an author in 2009. The three novel(s) features Maggie Benson, Rye Bennett, Tee Young, Carina Fielding Minuet', Latte Cunningham, and Brea Atoka. The run-away teenage girl, Carina, made her debut after living off the streets of Chicago. (The author became aware of how the homeless people lived while sight seeing and touring California.) Carina became a reality for the author when Rosemary began creating her mystery, romance novel about two college student(s): Maggie Benson, a journalism student, and Rye Bennett, a law student.